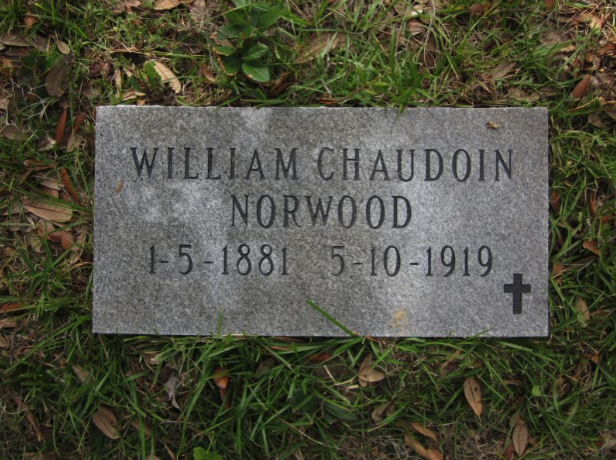 William C. Norwood, a merchant, came to Florida City from West Palm Beach in 1910 and homesteaded in sections 25 and 26. 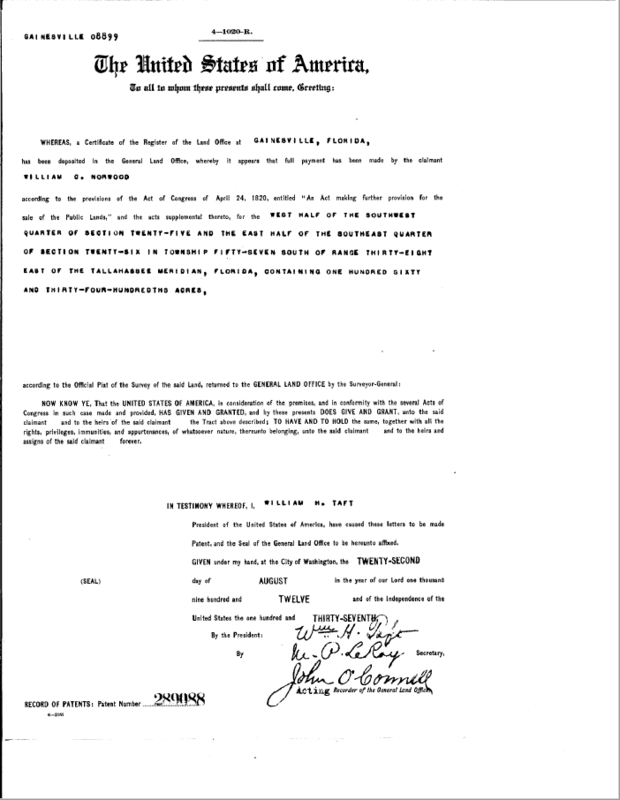 Searching the Bureau of Land Management records yielded the information that he was granted patent 289088 on the west half of the southwest quarter of section 25, township 57 south, range 38 east and the east half of the southeast quarter of section 26, township 57 south, range 38 east on August 22, 1912. Homesteaders could either wait the statutory time for proving up a homestead (7 years) or pay $1.25 per acre cash. Norwood evidently elected to do the latter, for he purchased the land on July 27, 1911 and paid it off on January 25, 1912. The amount he paid for the land, $200, would be equivalent to a little less than $5,000 in 2016 dollars. Norwood patentThis land was located 1/2 mile south of Palm Drive on either side of Redland Road. It extended 1/4 mile west and 1/4 mile east of Redland Road and went from S.W. 360th St. (Lucille Drive) to S.W. 368 St. This land is rather low-lying – the original pine rockland was located to the north and west of this property. William’s mother was Mary Emma Feaster and his uncle was Thomas Andrew Feaster (1858 – 1944), a large land-owner in the Florida City area. Thomas was in Miami as early as 1907 and owned the Miami Meat Market at 1317-19 Avenue D. In 1932, he was president of the Florida East Coast Growers Association, headquartered at 109 S.E. 1st St. in Miami. The Feasters were from South Carolina and the Norwoods were from Georgia. One of his cousins was Elbert A. Froscher, a prominent Realtor in Homestead. Elbert’s mother, Lavenia Feaster, was one of William’s aunts. In an article that appeared on October 11, 1912, in the Miami Herald, “Mr. W. M. (sic) Norwood’s new warehouse is a great addition to our town. It is built on the business lot bought of Mr. Edward Stiling and is on the corner of Avenue A and Palme (sic) avenue.” Norwood’s store, according to an article that appeared in the May 2, 1913 edition of the Miami Herald, was built “in front of his warehouse, erected a few months ago.” Norwood had obviously been working hard, if he had established his homestead and opened a store and warehouse by mid-1913. The store was located on the west side of the railroad tracks, where Rosita’s Mexican restaurant is now located. 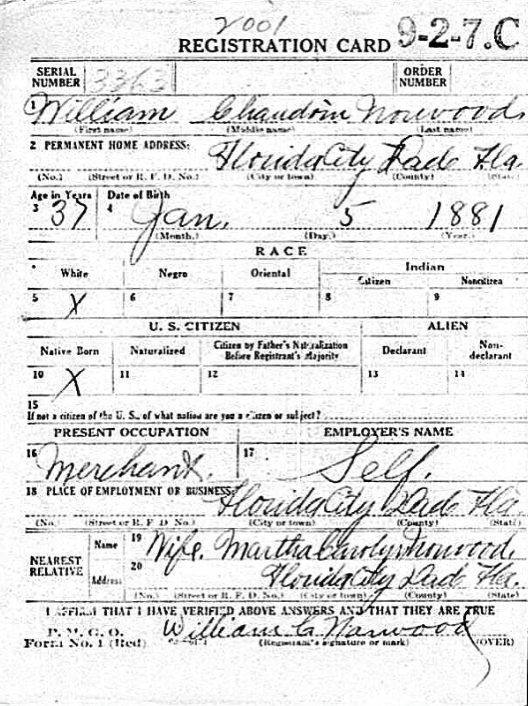 The 1945 Florida census stated that Martha C. Norwood had at least some college education and worked as a secretary. At that time, she was 57 and living at 1452 S.W. 2nd St. in precinct 79, which is in Miami. Jean Taylor, in her book The Villages of South Dade, wrote that Martha was the “secretary to the city attorney of Miami for seventeen years.” The fact that her mother-in-law’s brother was Thomas A. Feaster, a prominent man in Miami social circles, probably helped her land the job. It seems as though she never re-married after William’s untimely death.